Honor, the leading smartphone e-brand under the parent company Huawei Group, announced the first sale of Honor 8C on Amazon.in to begin from 10th December 2018, 12:00 AM IST. The Honor 8C is backed by a 4000mAh powerful battery, 13 MP+2 MP AI Dual camera, and a large 15.9cm HD+ Notch display for a long-lasting experience. 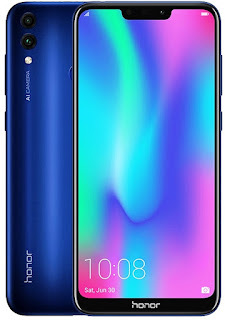 Honor 8C caters to specific needs of the various segments of the audience with its massive battery support that is housed in its sleek 7.98mm body. It is the World’s first phone to be powered with Snapdragon 632 8x 1.8GHz Qualcomm Kryo 250 CPU combined with 4 GB RAM and 32 GB / 64 GB storage. It also offers 3-card slot - Dual SIM slots + MicroSD slot. The dual bluetooth and ‘do not disturb’ mode is specifically designed keeping in mind the requirements of gamer segment of the audience. 8C is also equipped with a 13 MP+2 MP AI Dual camera with f1.8 aperture. This feature gives amazing low light photographs, real skin tone, and clarity. H.265 capability for higher quality videos in low memory (30% less space for same quality videos) lets users to store more content and Augmented Reality Mode captures funny camera shots with Audio and effects.